Matt originally took up CrossFit in his late 20s to help improve his endurance as a Denver area firefighter. After four Top 10 finishes at the CrossFit Games (including the runner-up slot in 2012), Chan became a full-time athlete and one of the most popular and knowledgeable veterans in the sport. Already 30 when he made his Games debut in 2008, Chan has had to battle through injuries and out-work a growing field of younger challengers to maintain his drive for the podium. In 2013, despite nagging knee problems, he showed his heart and resolve by taking first place at a Regional competition for an incredible sixth straight year. Two years later, Matt’s return from injury at the 2015 Southwest Regionals produced a Top 10 finish—not enough for a return to the Games, but a good indication that this all-time great can’t be counted out just yet. 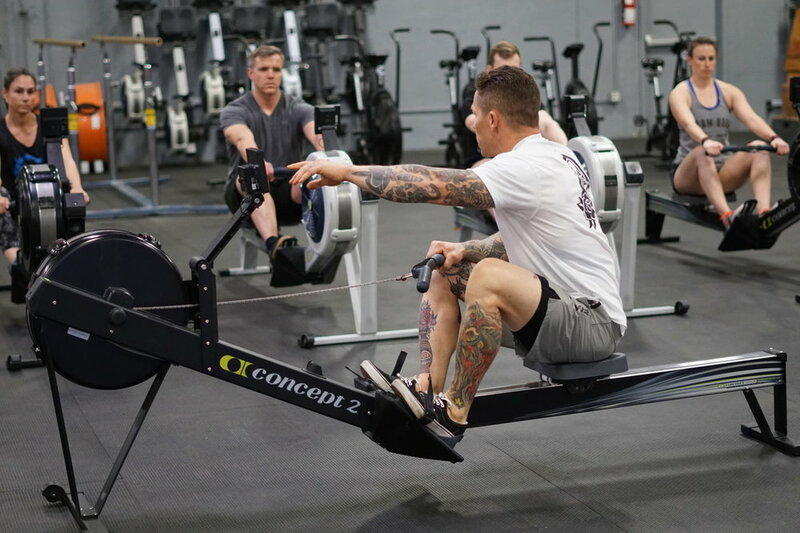 As a member of the CrossFit Trainer Staff, Matt works CrossFit Level 1 Courses, CrossFit Level 2 Courses, and CrossFit Competitors Courses, a weekend course that he, Eric O'Connor, and Chris Spealler codeveloped. He also coaches competition-based classes at gyms in the Colorado front range. Eric started his knowledge for fitness and programming at an early age through his own education and interest and graduated with a degree in Fitness Recreation. Following college he furthered his education by getting his CSCS certification which he then did not renew due to a difference in training philosophy. Eric also works nearly every weekend as a flowmaster, head trainer, and lecturer at CrossFit Level 1 Seminars and CrossFit Level 2 Seminars. He has also played an integral role in developing lectures and content for the CrossFit Competitors Course. He has been a coach at CrossFit Park City since 2008 where in addition to coaching classes and programming, he runs the Teens/Kids Programs, and does the programming for their Competitors Program. He also has done distance programming for affiliates through Pat Sherwoods CrossFit Linchpin distance programming avenue. Athletically, Eric was a Division 1 Collegiate wrestler for the University of Lock Haven. He has also competed in CrossFit Games 3 times placing in the top 20 in 2010 and has competed at regionals 5 times. Cherie found CrossFit in 2007 while looking for a program to get fit for mountain biking and climbing. Having competed in mountain biking, competing in CrossFit was a natural and fun way to express all of the hard training. Cherie competed twice as a CrossFit Games individual (2008, 2011), Once on a team (2009) and four times at a CrossFit Games Regional event (2009, 2010, 2011, 2012). With her highest achievement making it to the 2011 CrossFit Games after a back injury in 2009. Starting an affiliate with Matt in 2008 and joining the CrossFit seminar training staff in 2010, Cherie has over 10 years experience coaching CrossFit and training trainers. At 44, Cherie attributes her capacity to the last decade of training and is stronger and healthier then she has ever been. Her passion is in training as a lifestyle, staying injury free and having fun. Kevin started CrossFit in 2009 and has competed in Regionals every year since (3 times as an individual, & 5 times on team). He competed at the CrossFit games in 2012 & 2013 on CrossFit New England’s team (finishing in 2nd place overall in 2013), and also competed at the Games in 2016 on Back Country CrossFit’s team. Following high school Kevin immediately started accumulated certification and working as a personal trainer while studying Human Performance and Sport at Metro State University. Upon discovering CrossFit he opened an affiliate and ran it for 5 years before moving to the North East to Coach and learn from Ben Bergeron. He was a full time coach at CrossFit New England and while there he had the specific role as the competitors coach where he helped advise on all areas of competitions from mind set, nutrition, peaking, and game planning. He has since moved back to Colorado and now competes for Back Country CrossFit. In addition to coaching full time he also writes the programming for the competitors class, and played a key roll in programming for the team leading into the 2016 games. Kevin has worked for CrossFit Gymnastics for nearly 4 years now and has taught over 80 seminars all over the world in 20+ countries, visiting every continent except Antartica. His occupation for the last 14 years has been training and coaching in the fitness industry. Jared started training for CrossFit Competitions in September 2015 & qualified for Regionals in both 2016 & 2017. His love for human movement has distinguished him both as a talented athlete and an outstanding coach. In 2007, Jared was a State Champion wrestler in Iowa. Afterwards, he practiced strongman events from 2007-2010 and trained as a weightlifter from 2010-2015. Now, Jared jokes that it only took a 10 year break from conditioning to realize he's back where he belongs… in the "pain cave." Jared co-owns CrossFit Pandora's Box & Enderton Strength Barbell Club in Colorado Springs, CO. Jared has conducted weightlifting seminars since 2011 and specializes in weightlifting coaching. He is also the Strength & Conditioning Coach for the TeamUSA Sprint Cycling team at the Olympic Training Center. In the Powerlifting community, Laura Phelps holds the title of “Strongest Equipped Female Powerlifter of All-Time”, having broken 45 World Records in her 10 year career. She has continued her legacy by coaching other female Powerlifters, some also to All-Time world records. Laura is a member of Westside Barbell and is Westside Certified. She continues to train and coach others using the proven Westside Conjugate System.